I spotted some "old friends" yesterday scurrying over the rock walls, on the sidewalks, and in the landscaping at the Civic Garden Center of Greater Cincinnati. If you're a herpetologist, you would call my "friends" European wall lizards (Podarcis muralis). 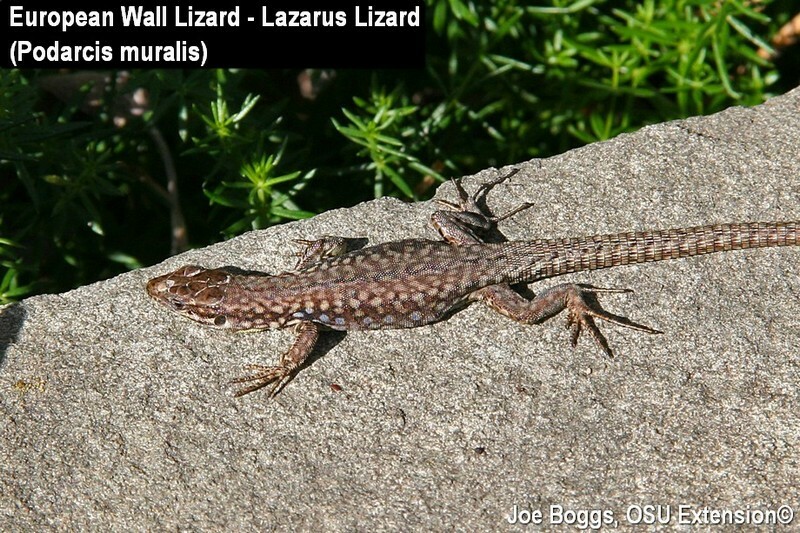 However, if you're a native Cincinnatian, you would likely identify these non-native lizards as "Lazarus lizards." I wrote about these lizards last year, but decided it would be good to revisit them. Remember that the common name for many animals as well as plants often depends upon where you stand; literally. This speaks to the focus of a fascinating tale. This is one of the lizards capable of shedding part of their tail to survive a predator's attack; a defense mechanism known as autotomy. The detached tail will continue to whip back and forth to further distract (bewilder?) a predator. A slight swelling of the tail often indicates where the old tail broke off and a new tale grew. However, the local common name "Lazarus" has nothing to do with dropping a tail to rise again. It's associated with the Lazarus family best known in Ohio for their connections with department stores. The climate in Milan is almost identical to Cincinnati and there are plenty of rocky habitats in southwest Ohio to accommodate the lizard's needs. Some of the European wall lizards thrived and eventually became so numerous that Torrence Court is still sometimes referred to as "Lizard Hill." The burgeoning Italian expats were locally renamed "Lazarus lizards" in misplaced recognition of their perceived patrons. Of course, they should have been named "George's Lizards." The lizard story may ring like local lore; however, George Rau wrote a letter in 1989 to herpetologists at the Cincinnati Museum of Natural History detailing his role as the lizard leader. He also repeated his story in several interviews with the news media. Research conducted by Cassandra Homan for her M.S. Thesis (see "More Information" below) added credibility to Rau's claim. She compared genetic samples collected from the Cincinnati lizards and from the source population in Europe and confirmed a substantial loss of genetic diversity indicating a genetic bottleneck. Her computer simulations suggested the bottleneck was likely associated with only three individuals serving as the founders of the Cincinnati populations. Indeed, the species has been so successful in colonizing southwest Ohio, it is now protected by law in the Ohio Revised Code. The "European wall lizard (Podarcis muralis)" is listed among the names of native reptiles in Chapter 1531: Division of Wildlife; 1531.01 Division of wildlife definitions. This is a rare achievement for a non-native animal. Of course, if you only step on their tail, you will not kill them; the tail will detach allowing the lizard to rise again.